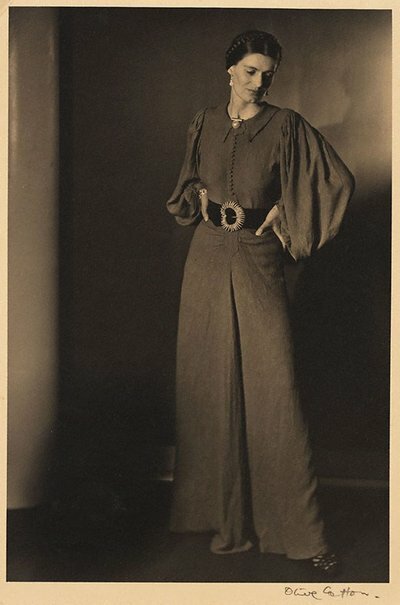 Gwynneth Stone was a friend of Cotton’s and was an artist and dress designer. Cotton wrote: ‘She was slim and graceful, with great poise and serenity. I enjoyed taking her portrait.’1 The portrait of Stone exists in three known variations – the pose offered here which is pensive due to the downward glance though the shadow on the wall behind and hands on hips serves to emphasise the height and strength of the figure. The National Library of Australia, Canberra holds a version where Stone is less an individual and more a clothes model (she wears the same clothes and jewellery but the emphasis is more on her silhouette). There is a 3rd variation in the collection of the National Gallery of Australia, Canberra where she is seated and the light is very strongly on Stone’s head and face. Cotton worked as a photographer until her second marriage to Ross McInerney and move to country NSW in 1946. Until 1964, when she set up a studio in Cowra she concentrated on childrearing and farm life. Rediscovered in 1981 her work was much sought after through the 1980s and 1990s and she continued taking photographs and printing her own work until 1996.